Between the 20th and the 24th of November, researchers are going in French high schools. Déclics exists since 2015. In 2016, around 10 DECLICS were organized in 5 academies. In 2017, Déclics broadens. It will reach 50 high schools in 10 academies and involve 3000 teenagers. They managed to change my point of view on scientific research. 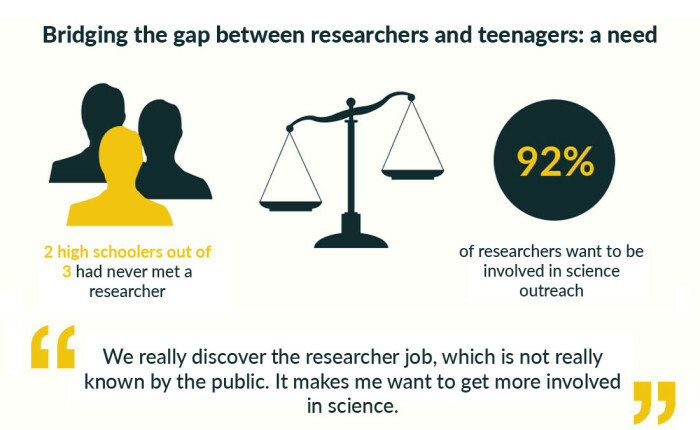 Moreover, it breaks the stereotypes, the prejudices we have when we think about research. This meeting REALLY promoted my students' curiosity. A privileged moment between the voluntary teachers of the high school and the researcher, about the big advances in his or her field during the past 15 years.